Powered by DogParkUSA.com, the new Dog Park Finder Plus iPhone App compiles photos and reviews to give you all the information you need for a quick trip to the dog park or for a vacation across the country with your pooch. 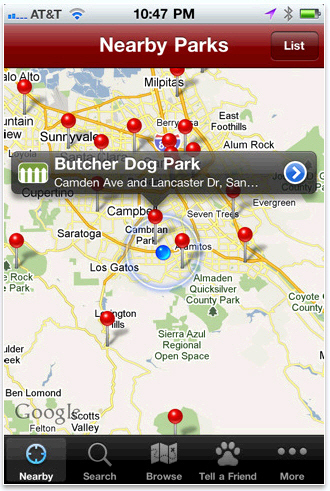 The Dog Park Finder Plus app displays local dog parks and search results in both map and list pages. Park details include user ratings, fenced and un-fenced markers, on-leash rules, hours and days of operation and many other features. 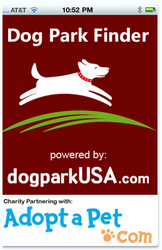 DogParkUSA.com is committed to the promotion of happy and healthy canine friends by advancing the awareness of responsibly maintained public dog play areas. "With so many dog loving people out there who want to know about new dog parks and news about current parks, we thought we should let people know about all the pets in need at shelters, so we contacted Adopt-a-Pet.com," said Greg Holsclaw, member of the creative team who designed the app. DogParkUSA.com is donating 15% of their proceeds to Adopt-a-Pet.com, North America's largest non-profit homeless pet adoption website, to support them in their mission of helping to find a happy home for every homeless pet. Adopt-a-Pet.com, which displays 155,000 pets for adoption at over 9,200 animal shelters across North America, is sponsored by Purina and Bayer Animal Health. "When I saw the app and realized it had over 5,000 listings for dog parks, dog friendly beaches and hiking trails, I just thought it was a very useful and fun tool for new pet adopters. We are thrilled that Dog Park Finder Plus will help promote pet adoption and let more people know about our free service, so that we can help get great pets into loving homes." says Adopt-a-Pet.com President and co-founder, David Meyer. The Dog Park Finder Plus App can be downloaded from the iTunes App Store. Says Holsclaw, "Through the use of innovative new tools, we hope to broadcast new dog parks and news about current parks to loving pet owners through our improved Dog Park Finder Plus, and we're very excited to benefit homeless pets while we do so that every dog can be lucky enough to enjoy a day at the park." There is also a free version of the app, Dog Park Finder that offers half the number of listings and does not include further information such as restrooms and bench availability in the parks. Adopt-a-Pet.com (formerly 1-800-Save-A-Pet.com) is North America's largest non-profit pet adoption website, helping over 9,200 animal shelters, humane societies, SPCAs, pet rescue groups, and pet adoption agencies advertise their homeless pets to adopters for free. Adopt-a-Pet.com displays photos and descriptions of adoptable pets to over 1.5 million people seeking to adopt a pet each month, and is funded by the passionate pet lovers at Purina and Bayer Animal Health. Aside from being able to adopt a dog or adopt a cat, Adopt-a-Pet.com visitors can also adopt a rabbit, horse, bird, reptile, amphibian, fish, farm-type animals and other small pets.